IN days of yore, American men were expected to have opinions about drink. A signature cocktail, and how to mix it, mattered. It was part of the male identity, like the ability to grill meat or change a carburetor. 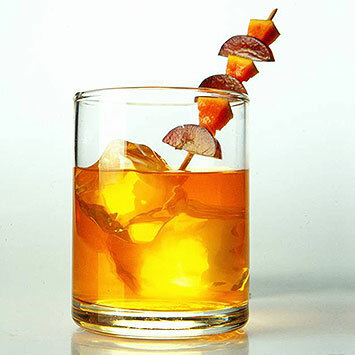 It was in this spirit that the literary critic Bernard DeVoto wrote a curious book, “The Hour: A Cocktail Manifesto.” First published in 1948, it has long been regarded as a classic, one of the first attempts to formulate a philosophy of the cocktail. It has been out of print for decades, but Tin House Books has just reissued it, and now, modern readers can recapture that moment from the middle of last century, when calibrating a martini was theology, not mixology. Mr. DeVoto, a Mark Twain scholar and the longtime resident of the “Easy Chair” column in Harper’s, lays down the law in words of fire, banishing all manner of mixed drinks to outer darkness, lamenting the perversion of national taste during Prohibition and flailing away indiscriminately at just about any target crossing his sightlines. Strait is the gate and narrow is the way to Mr. DeVoto’s magic cocktail kingdom. He abhors rum, because rum drinks require fruit juice, pure poison to any cocktail. Public enemy number one, in this regard, is the Bronx, a mixture of gin , vermouth and orange juice that, for Mr. DeVoto, ushered in the Orange Blossom and its ilk, so prominent during Prohibition. So the Bronx is out. And so, astonishingly, is the Manhattan — “an offense against piety” because it has vermouth. “With dry vermouth it is disreputable, with sweet vermouth disgusting.” The daiquiri he dismisses as “a regressive fantasy.” Hot drinks are verboten. Scotch is an abomination. The list goes on and on. In fact, Mr. DeVoto shrinks the cocktail universe to two drinks: “a slug of whiskey” and the martini. The first, of course, is not even a mixed drink. The second he surrounds with more caveats and fine-print instructions than a car-repair manual. First, no olives or onions or orange bitters. The martini can be shaken or stirred, but no ice particles should enter the drink. The strainer must be perforated, not encircled by a coiled wire. Only American gin is permissible. The drink should not be premixed and stored in a refrigerator, lest “the fragile tie of ecstasy” be snapped. You may hum, but not whistle, as you make the drink, which must be consumed in the city, for it is essentially an urban cocktail. In a spasm of gender generosity, Mr. DeVoto states outright that there is no reason why a woman cannot mix a proper martini. And the proportions? Mr. DeVoto, mortal enemy of sweet drinks, calls for a ratio of 3.7 parts gin to 1 part vermouth, with an upper limit of just over four to one. This is not a dry martini by modern standards, but in his day, when a half-and-half martini was common, this rates as arid. The finishing touch is two drops of lemon oil squeezed from a piece of rind, which may be deposited in the drink as long as it has no pith. Mr. DeVoto’s text is part Fourth of July oration, part sermon, part St. Crispin’s Day speech. It is written in the mock-heroic style favored by writers for The American Mercury — see Herbert Asbury’s extended introduction to Jerry Thomas ’s “Bon Vivant’s Companion” — and two-fisted drink columnists like Esquire’s Murdock Pemberton. It can be hard to take.